I hope you all had a happy candy filled halloween. Are you in need of a big healthy salad to get you back on track this week? 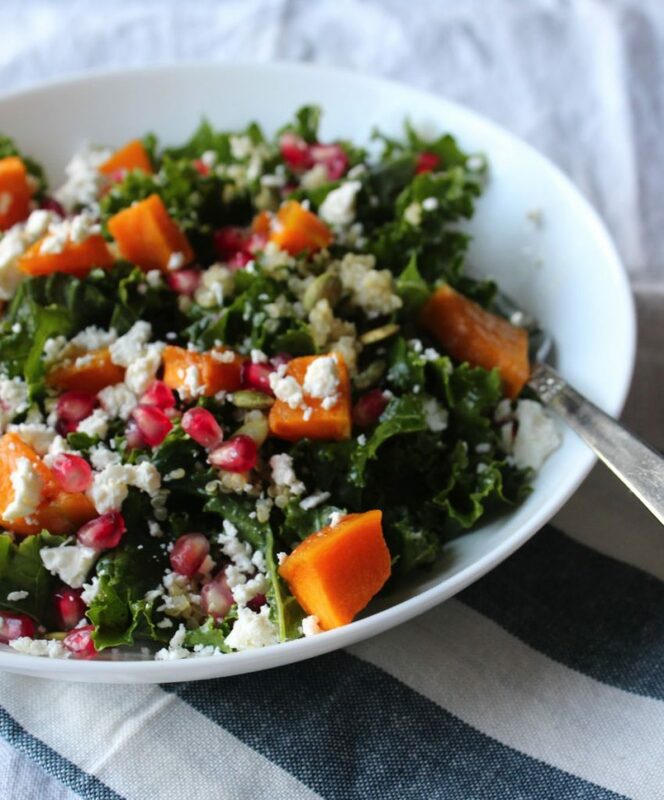 I have the perfect salad for you… Autumn harvest salad with roasted butternut squash. This salad is nutrient dense and tastes amazing. 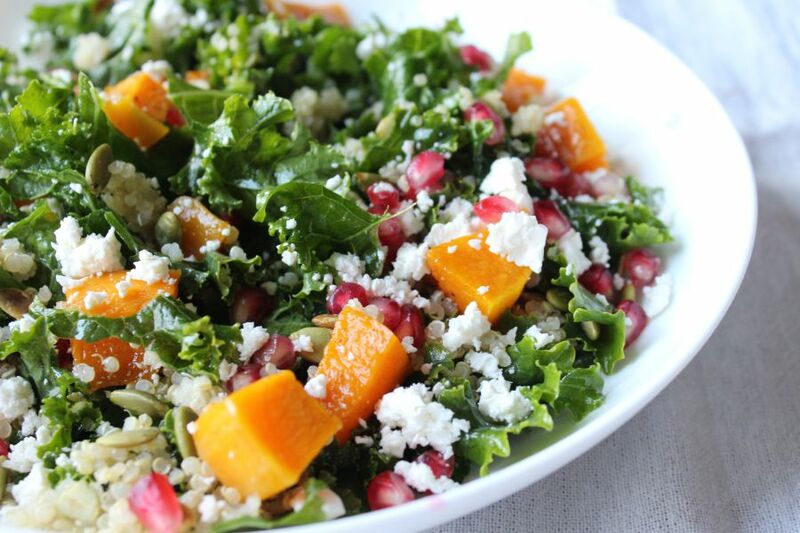 Packed with kale, quinoa, toasted pumpkin seeds, roasted butternut squash, crumbled feta cheese and pomegranates for a pretty finish. This hearty autumn harvest salad with roasted butternut squash makes a perfect lunch and or dinner . If you have been following me, you know I have a thing for kale. This was not always the case. You see the trick to Kale is you need to remove it from the stem, massage it for a couple of minutes in a small amount of homemade salad dressing. The longer it sits the better it tastes. There is so much to love about this autumn harvest roasted butternut squash salad. First, it’s loaded with protein, fibre, vitamins and minerals. Second, it’s hearty enough for a main dish but if you want you can add a grilled chicken breast or salmon fillet. Third, this autumn harvest salad with butternut squash tastes even better the next day. Now that’s a real salad in my eyes. Toss butternut squash in olive oil, maple syrup and cayenne pepper. In a large bowl combine kale and massage with 1 tbsp of salad dressing. 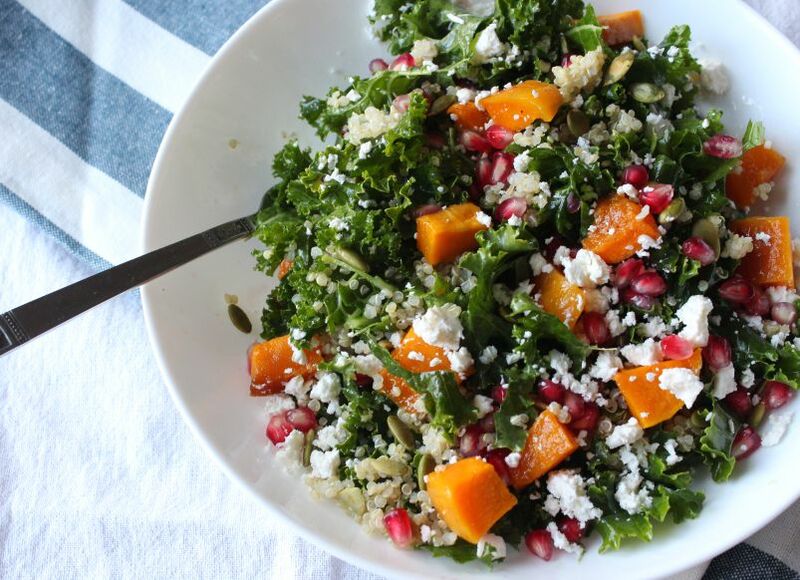 Add butternut squash, pumpkin seeds, and pomegranate seeds to kale. Toss with 1 tbsp of salad dressing.